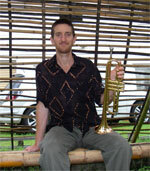 Peter Hunt is a singer, trumpet player and composer. He often plays by the river and on the street raising his point of view to and through one of song and dance. He harmonises with a diversity of musicians and has a gift for translating feeling into melody. He writes and plays with jazz-reggae groups kooii and ruby blue. Peter plays trumpet on 3 tracks on “Music is Life” – Lotus Born, Little Things and Dawey Wola.